CrossFit Thrive owner Max Shippee is also the strength and conditioning coach for the L.A. Temptation. Shippee appeared on the show alongside Brittainie De Garbott, the Lingerie Football League’s leading receiver. 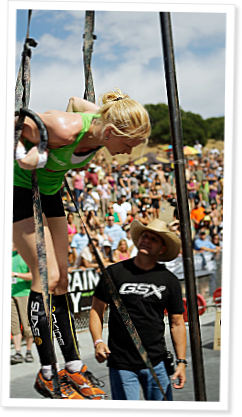 Jeff Tucker, Gymnastic Cert instructor and owner of GSX CrossFit, also joined Justin on Episode 90 of CrossFit Radio, webcast live at 6 p.m. PDT on Wednesday, Oct. 21, 2009. 3:57 Affiliate owner Max Shippee and Brittainie De Garbott, wide receiver for the Lingerie Football League’s L.A. Temptation, both came on to talk about how Shippee uses CrossFit and CrossFit Football to get beautiful athletes in peak condition. De Garbott talked about the league and how her performance has increased since she started CrossFitting, also detailing the before and after of her first WOD. 32:46 GSX CrossFit owner Jeff Tucker explained what it’s like to travel overseas and represent CrossFit at different certifications. The gregarious Texan talked about the global community and the hospitality he enjoys on the road. Tucker also commented on Gillian Mounsey’s efforts to raise money and awareness for Hope for the Warriors, and the role he will play in the event. Always the coach, Tucker gave advice on how to build up to several muscle-ups in a row. Tucker also gave some inside information about his invention, the Iron Beam, that will soon be available to CrossFitters. This is the 25th episode of CrossFit Radio, which aired at 6pm PST on January 26th, 2009. JJ- I would love to hear a segment on CF Radio from Dave Tate, who seems to be more involved in CF of late. It's really interesting with a background as a purely strength/power lifting type is involved in CF which constantly preaches GPP and all around physical preparedness.